Available now for nearly 70% of all cars, trucks, and SUV's. Exide's NASCAR Extreme advanced Silver Shield protection guards against heat corrosion and combines superior anti-shock design with long-lasting starting power. 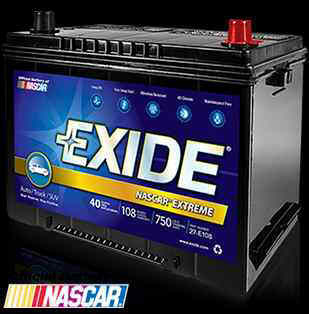 The NASCAR Extreme battery's advanced engineering delivers optimal performance in even the harshest conditions and is backed by a 40-month free replacement and 108-month limited warranty. Advanced Exide Silver Shield cast grid improves endurance. Heavy cast-on straps provide for a more rugged, durable design and improved connections between plates and straps. Less cracking under stress and longer battery life. 40-month free 24-hour emergency jump start assistance. Stabl-Lok TM anchored plates protect the battery from vibration damage. Heavy-duty grids versus ordinary car batteries provide enhanced durability under today's harsh operating conditions. Suitcase handle (on dual terminal products) with convenient grip for easy installation that folds down for a compact fit. Riveted side terminals are a durable, corrosion-resistant design. Now available in an expanded selection of group sizes - original equipment fitment in most vehicles.